Tax day is here, so let the last-minute mayhem begin. Some post offices will be open late Wednesday for procrastinators who don&apos;t file online. Some stores offer bargains to ease the pain. And watchdog groups are issuing reports on where taxes go and the cost of government. Oh, and the odds of being in a fatal crash jumps by 6 percent on tax-filing day, according to a 2012 study by University of Toronto researchers published in The Journal of the American Medical Association. The reason: higher levels of stress. Two post offices will extend their hours Wednesday. Salt Lake City&apos;s main post office, 1760 W. 2100 South, will be open until 8:15 p.m. Provo&apos;s East Bay post office, 936 S. 250 East, will be open until 8:30 p.m.
Tax day has become a time for businesses to offer deals to bring financial relief  even if the taxes do not. This year, however, relatively few materialized locally. Allegiant Air&apos;s ads urged Utahns to use tax refunds for one-way flights from Provo to Los Angeles starting at $42. HydroMassage is providing free massages at a variety of gyms, spas and other locations, with coupons available online at hydromassage.com. Pizza Hut is staging a contest for gift cards for customers who fill out a "P2" form at pizzareturn.com. On it, diners note whether they are "married ordering separately" and list dependents, which can include "degenerate friends." Royal Caribbean International is offering to pay cruise taxes, fees and port expenses  worth up to $219  for cruises booked on tax day. Online retailer Tonzof is pitching 10 percent off orders over $25 on that day. Hard Rock Cafe, which has no Utah presence, is allowing patrons to sing to the restaurant for a free burger. California Tortilla is serving free chips and queso with orders as long as patrons remember to say "taxes schmaxes." While Wednesday is filing day, Utahns will have to wait until Monday, April 20, for "Tax Freedom Day"  when residents will have collectively earned enough to pay their combined federal, state and local tax bill for the year  if they had spent no money on anything else. The nonpartisan Tax Foundation calculates the freedom day for the nation and each state every year. This year, Utah will be the 27th state to reach Tax Freedom Day when it arrives Monday, and it will come four days earlier than the national average. "It&apos;s important for taxpayers to understand the cost of government," Tax Foundation economist Kyle Pomerleau. "Tax Freedom Day helps people relate to that cost." The Tax Foundation notes that Americans will spend more on taxes in 2015 than they will on food, clothing and housing combined. Nationally, Tax Freedom Day is arriving a day later this year. The National Priorities Project also figures out the average federal tax bill for residents of each state and where all the money goes. It said the average Utah taxpayer paid $10,454 to the federal government in 2014  $2,538 less than the U.S. average because of such factors as lower wages and higher deductions from larger families. Of that tax bill, $1,600, or 15 percent, went for interest on the national debt, while $2,820, or 27 percent, paid for the military. The group said $2,769, or 26 percent, went toward federal shares of health-care programs such as Medicaid. Among other highlights, $312 helped fund food stamps, $27.70 paid for federal prisons, $135.08 went toward student aid, and $5.32 boosted housing and community programs. WalletHub, a personal-finance service and website, released a study Tuesday ranking Utah seventh on its return on investment for the state taxes it pays. It says Utahns pays state taxes that are relatively low for services that generally are better than elsewhere. Utah ranks No. 14 for low taxes, but third for the best economy and seventh for health and the condition of public facilities. WalletHub also puts Utah No. 12 in safety, No. 26 in education and No. 28 in pollution. Finally, if taxpayers need last-minute help, the IRS is urging them to look for it online  and not to call or visit because waits will be long. IRS.gov offers answers to most general tax questions, along with copies of tax forms and publications. 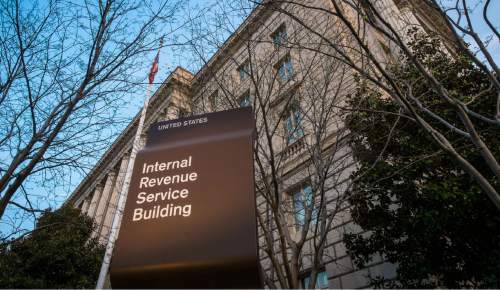 "We are doing everything we can to help taxpayers get the assistance they need during the filing season," IRS Commissioner John Koskinen said, "yet, many still face long waits." The agency also reminds taxpayers facing problems they cannot solve for now that they may file for an automatic extension. Even with an automatic extension, however, any tax payments are still due Wednesday. Thirty Utah post offices have always-open self-service kiosks. If mailing labels are purchased and printed there before midnight, taxpayers will have an April 15 postmark. They include: American Fork, Bountiful, Cottonwood, Draper, Kearns, Layton, Lehi, Logan, Millcreek, Murray, Ogden Ben Lomond, Ogden Mount Ogden, Orem Main, Orem Mountain Shadows, Pleasant Grove, Provo East Bay, Provo Main, Riverton, Roy, South Jordan, St. George Red Rocks, St. George Downtown, Salt Lake City Downtown, Salt Lake City Foothill, Salt Lake City Main, Salt Lake City Sugar House, Sandy Alta Canyon, Sandy Main, West Jordan, West Valley City.